Inspired by the old I.W.W. 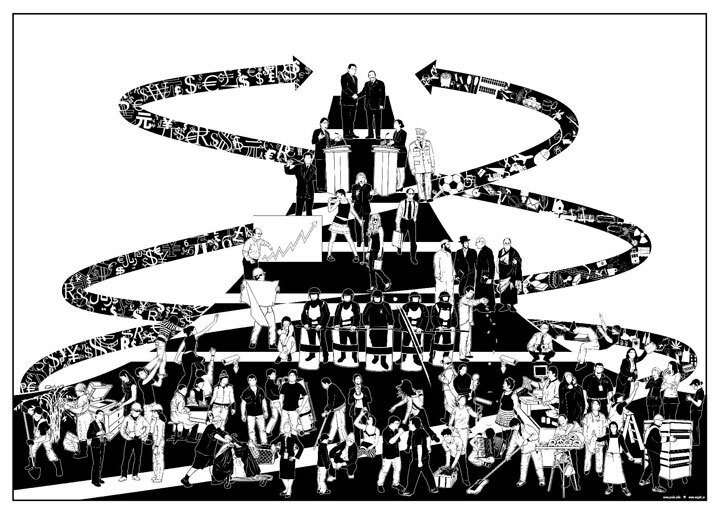 “PYRAMID of CAPITALIST SYSTEM”, this poster is a portrayal of class society as it appears to us today. The whirlwind of market forces encircle and shape society, operating through our activity, yet behind our backs. People at different levels of the modern capitalist pyramid enjoy it or defend it or cope with it or fight it or get drunk to forget about their place in it. This poster was designed in collaboration by wapiti.se and prole.info. Download a print quality PDF of the new pyramid of the capitalist system here. Order the Rouge Forum version of the original IWW pyramid of the capitalist system here.